Get up close and Personal!! See Champion Bodybuilders, past and present at the 2003 Olympia!! Includes a rare interview with SERGIO OLIVA at the Expo. New pro, Mat Duvall, hits some poses for us, and Chris Cook also hits some shots for our camera, along with many more stars. And there’s poolside posing with Melvin and Siggi. Get up close and personal with the champions!! See Champion Bodybuilders, past and present at the 2003 Olympia!! Includes a rare interview with SERGIO OLIVA at the Expo. New pro, Mat Duvall, hits some poses for us, and Chris Cook also hits some shots for our camera, along with many more stars. And there’s poolside posing with Melvin Anthony and Siggi Segers. Front cover photos clockwise from top, MAT DUVALL, DAVID HUGHES & CHRIS COOK. You will also see Ronnie at the Athletes’ Meeting and Ronnie and the other guys at the exciting and controversial Press Conference. 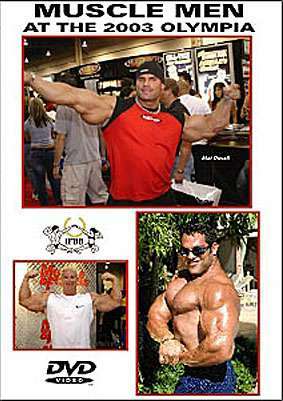 John Balik (Editor, Iron Man magazine) and Tom Lincir (founder of Ivanko Barbells) also feature. Organised by Wayne DeMilia, this is one of the best ever Olympia Expos. It had something for everyone.